Hanging out with Joe and Sara in the morning. Shakespeare on the plantations in the evening. Ithaca Shakespeare Company put on an excellent production of As You Like It. 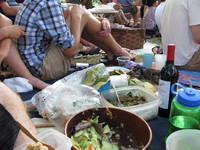 Picnic on the plantations and Purity after the show. Ahhhh!